*Child has any chronic condition. The Aboriginal Children’s Survey asked about long-term health condition diagnosed by a health professional. Source: CICH graphic created using data adapted from Crengle,S., Freemantle, J., Gallaher, G., McAullay, D., McShane, K., & Taualii, M. (2009). Indigenous Children’s Health Report: Health Assessment in Action. Edited by Janet Smylie and Paul Adomako using data from Statistics Canada. 2006 Aboriginal Children’s Survey. http://caid.ca/IndChiHeaRep2009.pdf -accessed July 26, 2017. 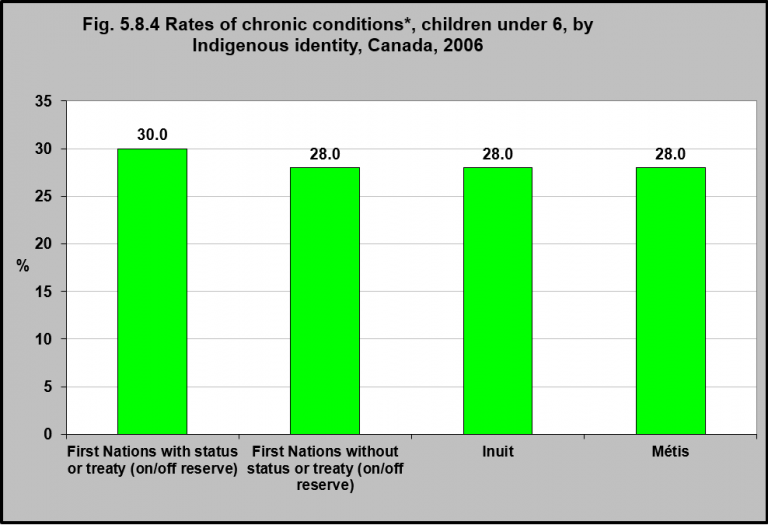 In 2006, the rate of chronic conditions among First Nations children under 6 with status or treaty (on/off reserve) was 30%. The rate of chronic conditions among First Nations children without status or treaty, Inuit children and Métis children of the same age group was 28%.